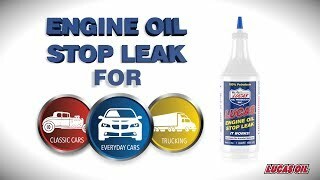 This stuff is that good it stopped the leak with 4 quarts oil and 1/3 of a quart of Lucas. My 2007 Honda Civic 100,000 miles developed a timing chain seal oil leak, about the size of a quarter. Took the car to the dealer and had the oil changed (4 quarts). Added only 1/3 of the required amount of Lucas Stop Leak. Did not want to over fill the required oil capacity. 1500 miles later no more oil leak. This test was off the required amount of 3 quarts oil and 1 quart Lucas, however this stuff is that good it stopped the leak with 4 quarts oil and 1/3 of a quart of Lucas. Just took longer. -Nick C.